John Atencio Goldsmith, LTD was founded in 1976. Throughout the 80s, John Atencio established an important national reputation with his unique combination of bold geometric shapes, precious metals, distinctive and inspired design, and superb craftsmanship. Simultaneously, the John Atencio jewelry company garnered attention for its proven business strategy using retail stores as the foundation, and in essence, artist's gallery. The vertical integration of design, manufacturing, retail and wholesale distribution was unheard of at the time and has since become a model that has been replicated throughout the designer jewelry sector. A classic John Atencio design. 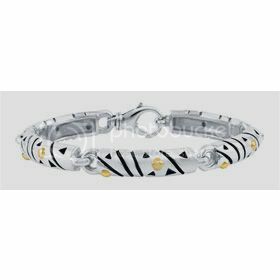 This sterling silver geometric link bracelet is accented by black lines. Bracelet measures 5/8" (w). 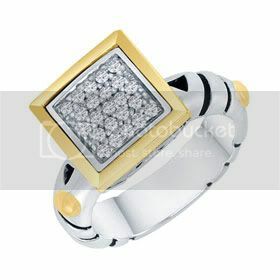 Diamonds (.23 ctw) adorn this sterling silver ring which is accented by black lines and an 18k yellow gold. Available in size 6.5 only. Ring measures 9/16" (w). 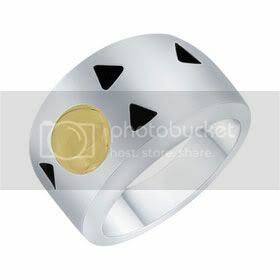 This sterling silver ring is accented by black lines and an 18k yellow gold beads. Available in size 6.5 only. Ring measures 5/8" (w). 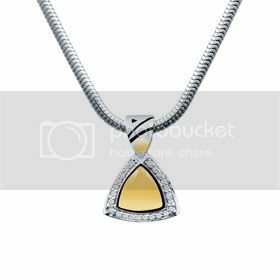 Diamonds (.24 ctw) adorn this sterling silver pendant which is accented by black lines and 18k yellow gold. Comes with a matching 18-inch chain. Pendant measures 15/16" (h). 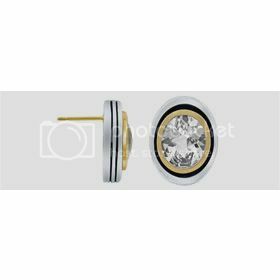 Stunning white topaz sit in the center of these sterling silver earrings which are accented by black lines and 18k yellow gold beads. Earrings measure 3/4" (h) x 5/8" (w). 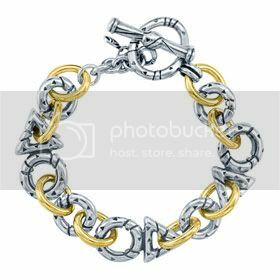 This sterling silver link bracelet is accented by black lines and 18k yellow gold beads. Bracelet measures 1 3/4" (w). 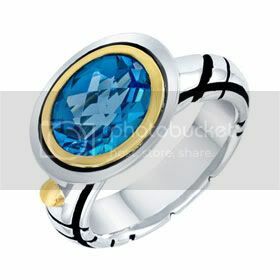 A stunning blue topaz sits atop this sterling silver ring which is accented by black lines and 18k yellow gold beads. Available in size 6.5 only. Ring measures 3/8" (w). 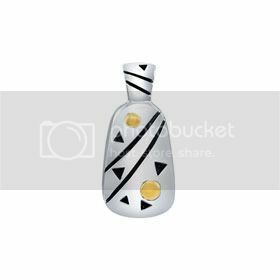 This sterling silver pendant is accented by black lines and 18k yellow gold beads. Chain sold separately. Pendant measures 1 3/4" (w). 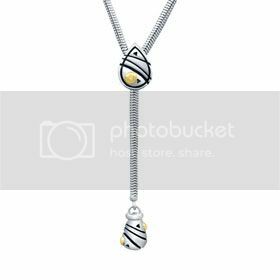 This sterling silver necklace is accented by black lines and 18k yellow gold beads. Necklace is adjustable up to 26 inches. 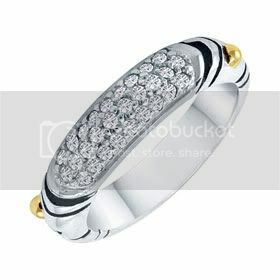 Diamonds (.28 ctw) adorn this sterling silver ring which is accented by black lines and an 18k yellow gold. Available in size 6.5 only. Ring measures 1/4" (w).